First of all one has to mention that whatever we believe, how a genus or species developed over the past centuries, this is only based on the species which are currently living, and on phenotypes (based on its appearance), genotypes (based on its genes), observations and conclusions which are taken from it. It may well be that the evolution was a bit different in reality, and that some facts are not known as there is no obvious sign visible now. For example, two previous species could have hybridized and the hybrid could have been more competitive than one or both of the parent species, and developed over time into its own species (while the parents may have not survived; at least not where the hybrid took over). Please note that the evolution I am describing here is based on my knowledge and experience with the species, but it can be that the order of when which group split off could be slightly different. A genus or species does not develop within one year or two; it takes a long time. This usually means several hundreds and thousands of years. There is no definite date when one can say, "now this is a new species", as nature is constantly changing, and humans do not have definite rules as to what or how many differences are necessary in order to separate it from the other species or genus. Besides there are differences hardly detectable by human eye and nose, but they are still existing differences. In addition, you have to know that the individuals of a species are not all genetically uniform like a registered cultivar. They have many characteristic variations. Mankind has named such unique and distinct variations as follows: a "clone" (for genetically identical plants), a "form" (with mainly one obvious difference like colour, but the plants belonging to it are not genetically identical) or "variety" (with several differences). But as the rules are not precise and because nature is always changing, some people classify a plant as species, others as variety (or subspecies) or form. Even on the higher classification like genus, family and so on, people do not always have the same opinion as others. In this article I used more or less the common terminology for the species and varieties. However, I may group some of them differently from those found in the literature, based on my knowledge of the available literature and my own experience with the species. 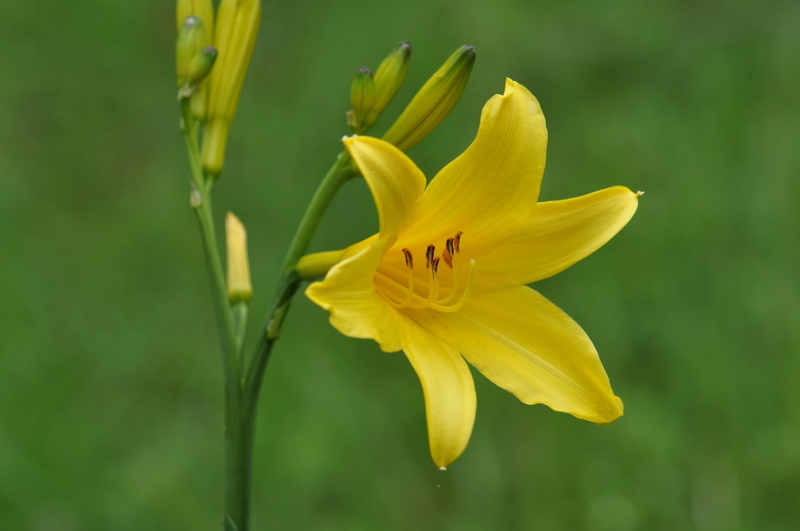 So let's start to describe the evolution of the Hemerocallis species. 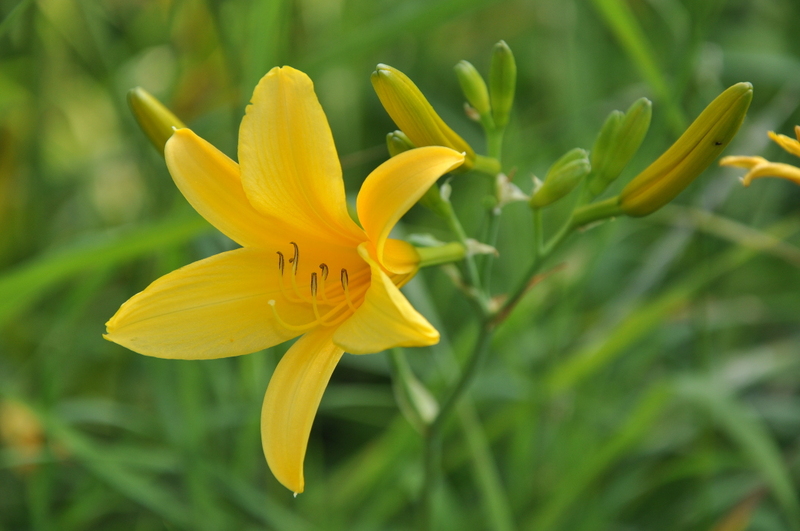 First, there was a plant population from which a swarm of plants separated off, which could be called Hemerocallis. Yes, you heard correctly, it was not a single plant or genetically uniform plant. It was a whole set of plants with a wide variation in it, and with several traits already different from the rest of that plant population. Some of these variations disappeared over time, and some new variations developed. As nature is always in flow and the organisms like plants, animals, insects, fungi etc. 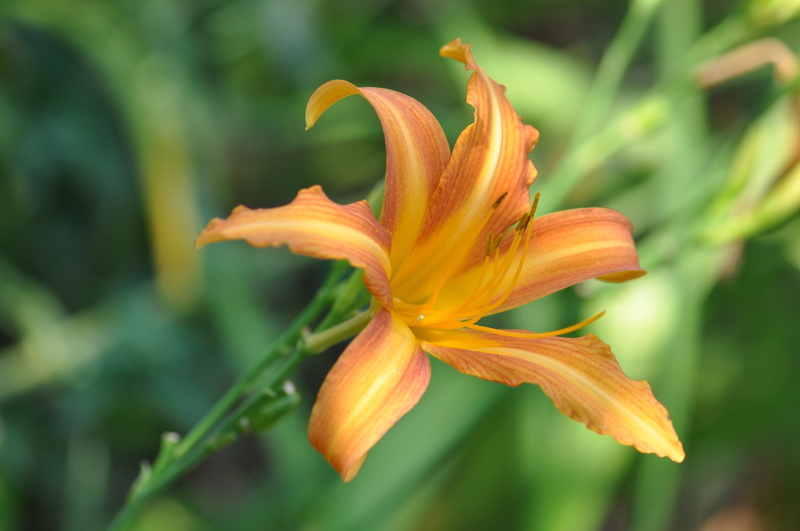 steadily change, adapt and develop, there is no definite time when the genus Hemerocallis really appeared (it just happened over a long period of time). 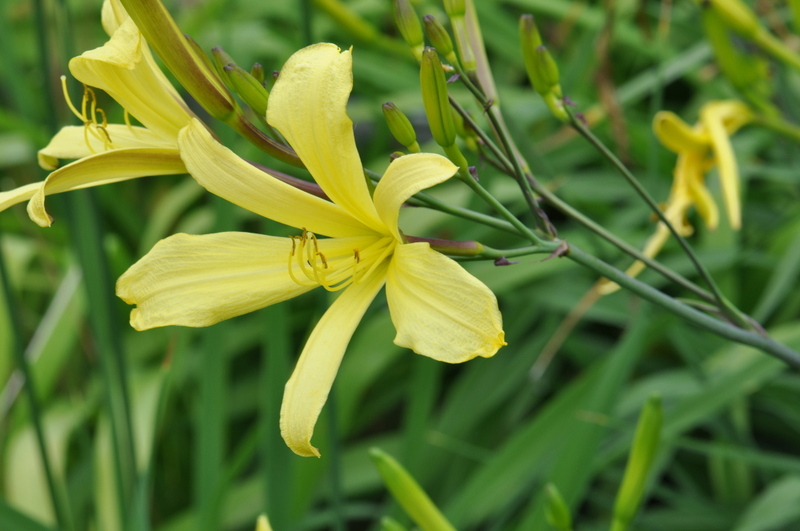 The first Hemerocallis probably looked a bit like H. hakuunensis and contained a lot of traits which can still be seen in the present, but different Hemerocallis species. For example: more or less dark brown-red colour on the outside of the sepal, different height, variation in branching, opening time of flower, duration of a flower, fragrance, and size of flower segments (i.e. width as well as length and its ratio). Probably there was also a variation in flower colour, i.e. brighter and darker yellow-orange, and probably there was no eye as we can find it nowadays in H. fulva and its varieties and clones. Nature has the law of "survival of the fittest" and a constant competitive fight, and evolution takes place between the plants, animals, pests and diseases. In addition, there is a co-evolution with the pollinator as well as with the fruit or seed eaters. Therefore, over a period of time, a certain selection happens which led to either extinction of not well adapted plants or further adaptation and combination of some traits or features. 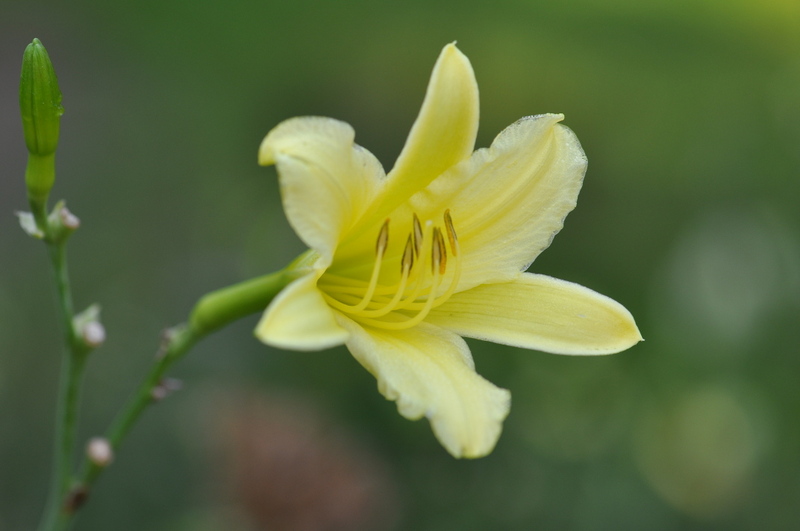 This resulted over a period of time, in a first separation in the genus Hemerocallis, which ended in a group of yellow daylilies with fragrant, nocturnal and extended flowering. 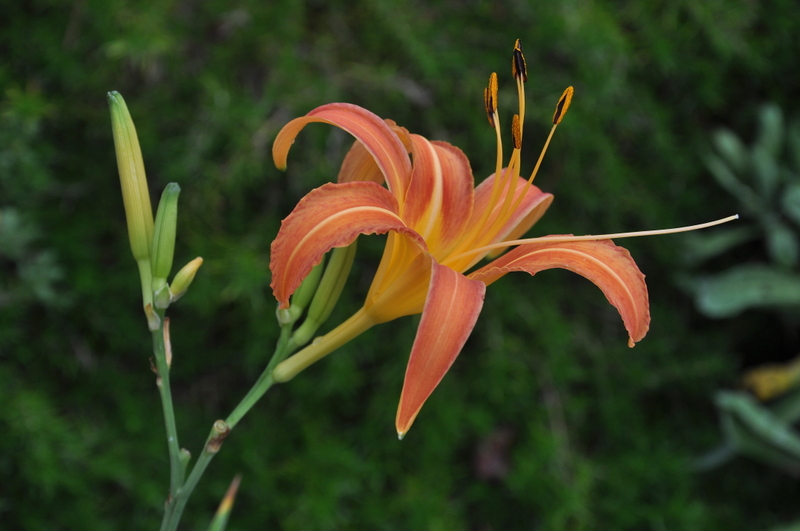 Also, it resulted in a group of diurnal, orange daylilies with faintly fragrant flower. This means we got the "yellow" group: the citrina-lilioasphodelus group and the "orange" group: the middendorffii-multiflora-fulva group. Then a genetic aberration allowed a diurnal (orange) plant to get more orange colour on the inside of the flower segments; this was even intensified above the throat, which we now call an "eye". 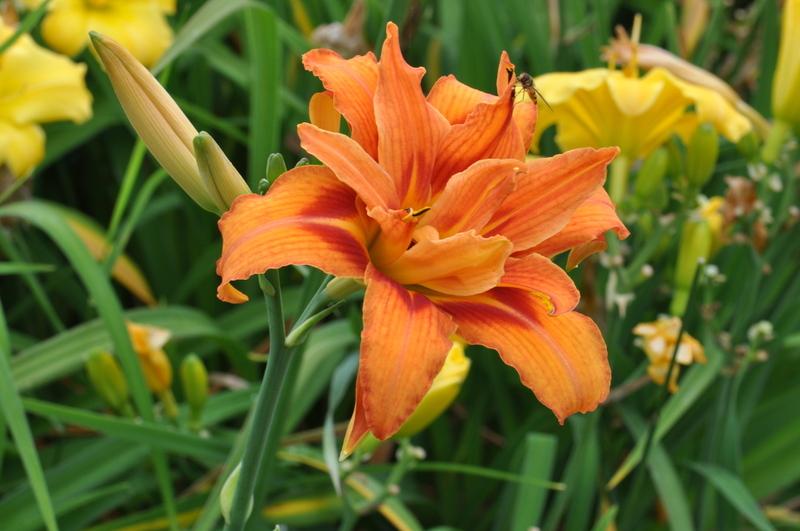 The crossing between this plant with other diurnal "orange" daylilies soon resulted in a wider distribution of this new trait. 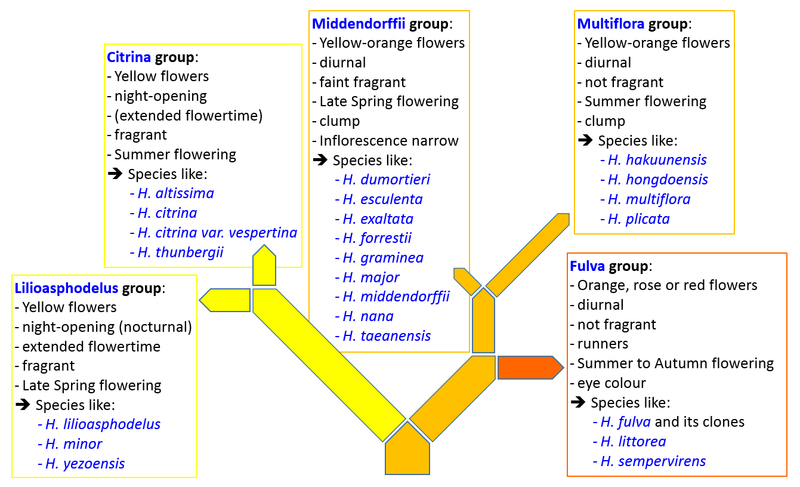 That way, the Fulva group (Fulvae) has probably developed and separated from the "yellow-orange": the middendorffii-multiflora group. Growth in different niches with different environmental influences (like plant society and its competition, temperature, water, light, wind, soil, nutrients, animals, pests and diseases) allowed further segregation of traits, and led to the distinction of individual species. This then resulted in another split of the "yellow" group as well as of the "orange" group. 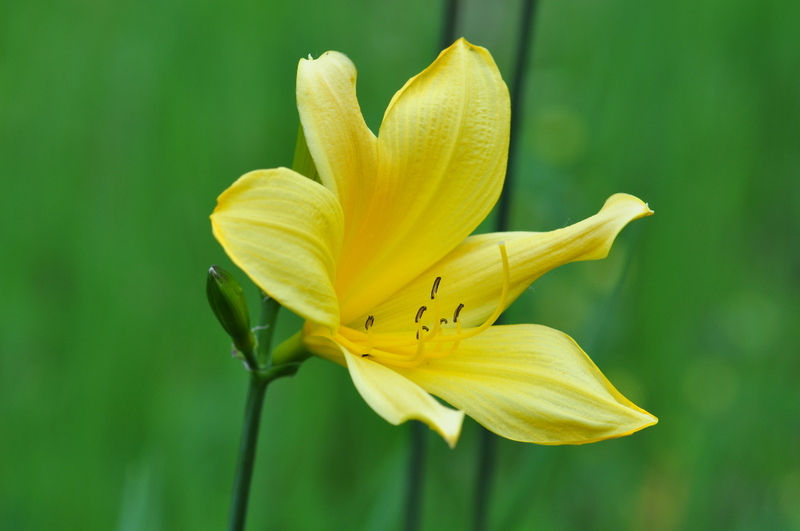 This way, the early yellow-flowering daylilies, the Lilioasphodelus group (Flavae) developed. 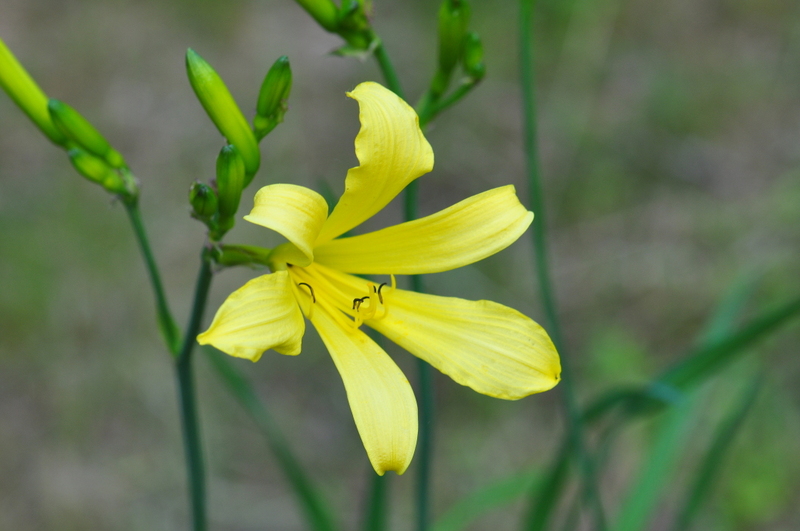 Also separated from the midseason, yellow-flowering daylilies, is the Citrina group (Citrinae). 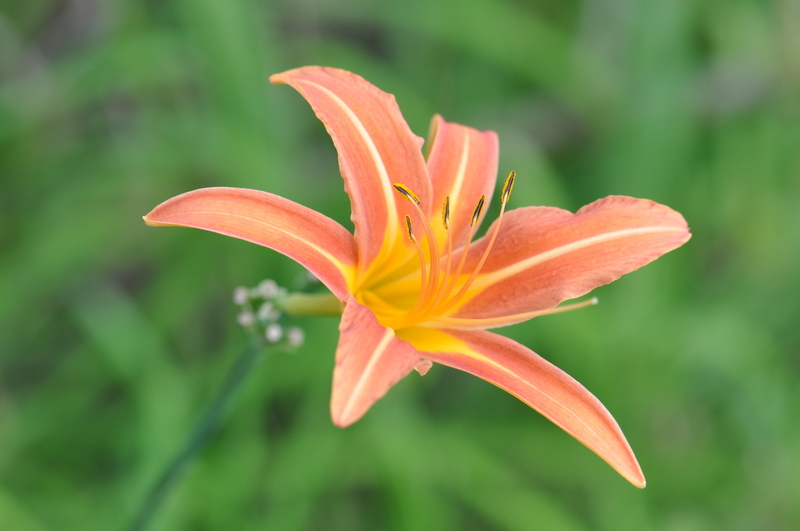 In addition, the orange daylilies also split into the early flowering Middendorffii group (Middendorffiae), and the midseason flowering daylilies split into the Multiflora group (Multiflorae). In the Fulva group, a soft split between the midseason and late season flowering plants took place, and this is still in progress. That is why two Japanese species are sometimes given a species status, and sometimes only a varietal status (for example: H. littorea and H. sempervirens). How the evolution of the individual species within the sections developed is difficult to say, as they may have slowly developed from the swarm of plants within the group, and may also have mixed again after being a bit separated in their niches especially if the niches were not far apart. If H. fulva would have split off before the Citrina-Lilioasphodelus group, we would probably still find some H. fulva species which are faintly fragrant as is the case with plants in the Middendorffii group, but there is no fragrance detectible by human nose on any H. fulva species. There is no bright yellow as a dominant colour for the flower segments with an orange-red eye in any H. fulva species, but there is still the yellow-orange colour present as a dominant colour in some H. fulva species/clones. 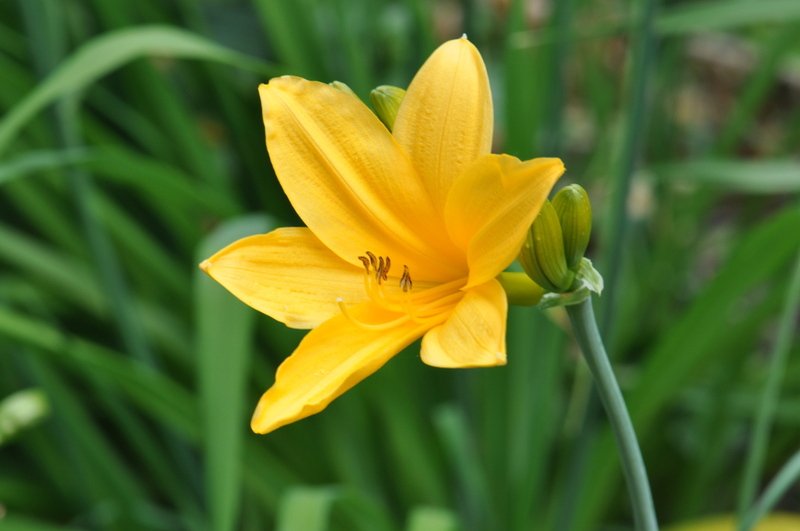 Probably the first swarm of Hemerocallis plants had a wide range from yellow to yellow-orange, and the time of flower opening was not fixed, i.e. some opened in the morning, some in the afternoon, some in the evening and some in the night. The brighter the colour the better visibility in the dark and, therefore, they were also more often visited by the nocturnal pollinators. As the nocturnal pollinators visited the flowers with brighter colour and strong odour, all other nocturnal flowers with less odour or darker colour like orange, were rarely pollinated. Self-pollination could result in seeds but this reduces the genetic possibility to adapt to changes, increases the possibility of genetic defects and the reduction of vitality and resistance against pests and diseases. Over a period of time, the nocturnal bright yellow flowering plants were more competitive than the nocturnal flowering plants with yellow-orange flowers (i.e. darker flowers with no or only little fragrance) because they were pollinated. Therefore, they could also survive as seeds, when all the plants disappeared due to pests or diseases. While the nocturnal species with yellow-coloured flowers had better visibility in the night (i.e. natural selection by pollination, combined with strong odour), the yellow-orange colour probably had an advantage for pollination during the day (with other daytime-active pollinators, and maybe in addition with some sunlight-UV effects on the flower tepals). An Fl hybrid between a H. fulva and a yellow species like, for example, H. altissima, resulted in a yellow-orange base colour with some orange overcast and a faint eye. This can be seen in H. 'Autumn Minaret'. However, there would be further generations: F2, F3, etc. which certainly would also result in plants with a yellow dominant colour with an eye in orange or red colour. Maybe it would not be chosen by pollinators, but the plants would still live and propagate vegetatively, as long as the habitat was not destroyed. No such plant was ever described so far. 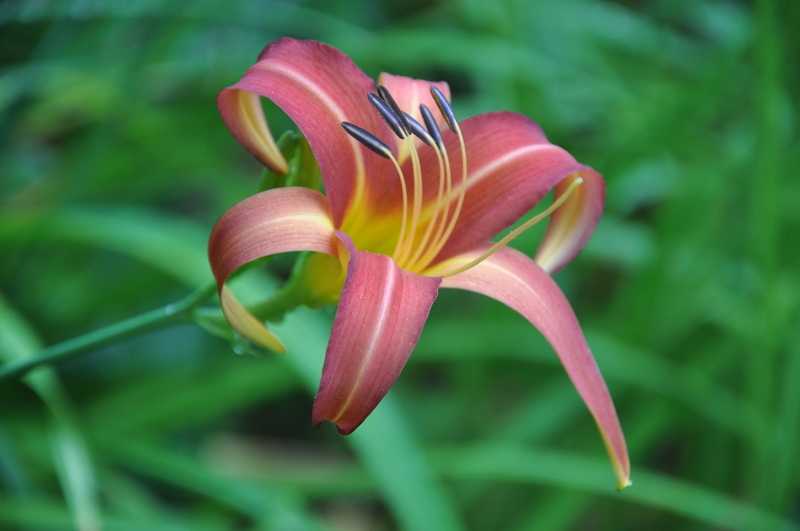 Therefore, the night-flowering daylily species must have separated before the H. fulva developed. 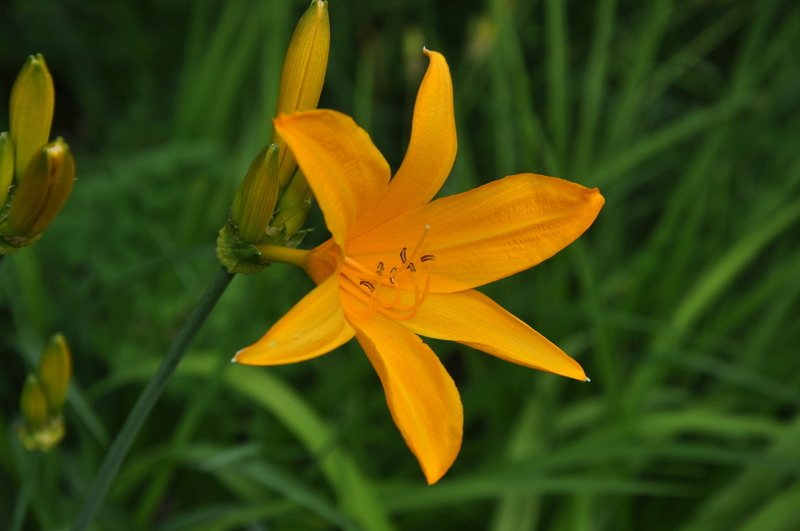 As the first flower of H. fulva occurs in early summer, when the early flowering species are over or have passed the peak season, it is to be assumed that the genetic change resulting in H. fulva happened to a summer-flowering yellow-orange plant, but the scape of the H. fulva daylilies are not comparable with the scapes of the Multiflora group; they are closer to the Middendorffii group, but not so reduced concerning the branching. That is another reason why the Fulva group probably occurred before the splitting of the Middendorffii-Multiflora group. Another reason is that H. fulva produces runners, while the Middendorffii and Multiflora group are always in clumps. The only species which also makes runners beside H. fulva is H. lilioasphodelus. H. minor (Miller, 1768) has only very few flowers per scape. 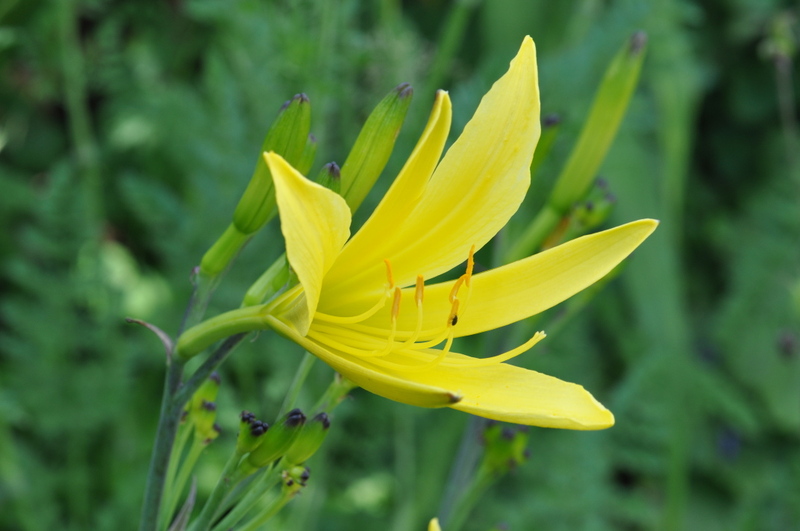 This is a low growing species with grass-like leaves and 1mm thin roots without swellings (normally Hemerocallis roots have thicker parts towards the end of the main roots). It grows as a very narrow clump. H. lilioasphodelus (Linne, 1753) is long known in Europe (together with H. fulva 'Europa'). Its original distribution, therefore, is not known but it is native in China (maybe also originally in Korea). For a long time it has been naturalized in Central Europe. 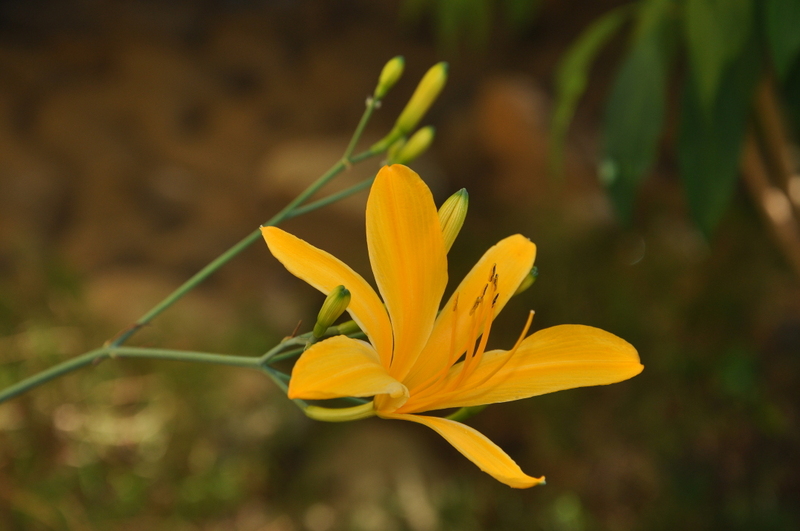 It is the only one of the yellow and yellow-orange flowering species that makes runners (i.e. underground stolon that allow the plant to invade faster its neighbouring area). The plant habit is, therefore, not really clump-like when it is given space to grow. H. yezoensis (Hara, 1937) is very similar to H. lilioasphodelus, but differs from it by having larger flowers, a shorter tube with the flower buds in the upper quarter and are uniformly green-yellow (on H. lilioasphodelus, the buds have a pronounced green tip while the rest of the bud is yellow). It sometimes reblooms in autumn. H. yezoensis grows in Japan, while H. lilioasphodelus is native in China. H. thunbergii (Baker, 1890) is in some respect similar to H. citrina var. vespertina, but the scapes are not as tall, it has less branching and, therefore, less buds are found per scape. The flower as such is a bit smaller and the petals are a bit wider. H. altissima (Stout, 1942) got its name due to its tall scapes which can be up to 2m tall. The buds are also sometimes used as vegetables after being dried (but more often this is done with H. citrina buds). The flowers are much smaller than H. citrina and a bit smaller than H. citrina var. vespertina, while the good branching is similar. The flower is not spidery at all (compared with H. citrina or H. citrina var. vespertina). In shape the flowers resemble those of H. thunbergii. 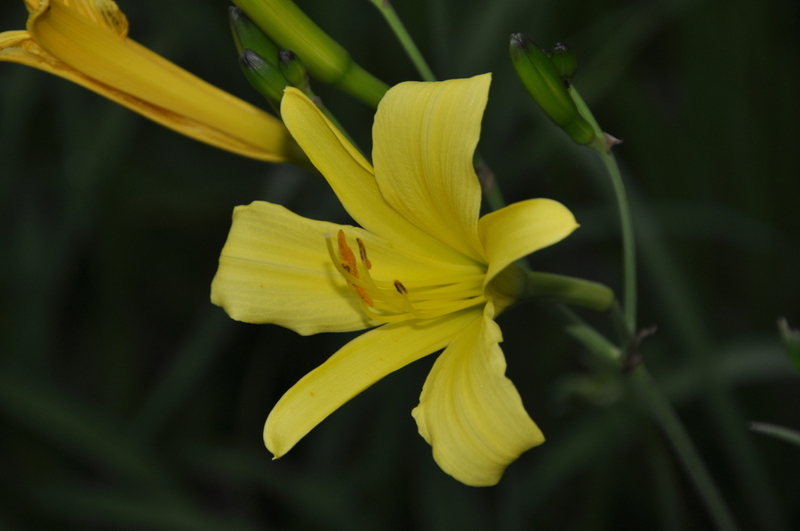 H. citrina (Baroni, 1897) is the most odorous Hemerocallis species. Probably due to this trait, its buds are collected shortly before opening in the late afternoon, dried and sold as vegetables, which are then added to meat and/or other vegetables. (sometimes H. altissima is also used the same way). 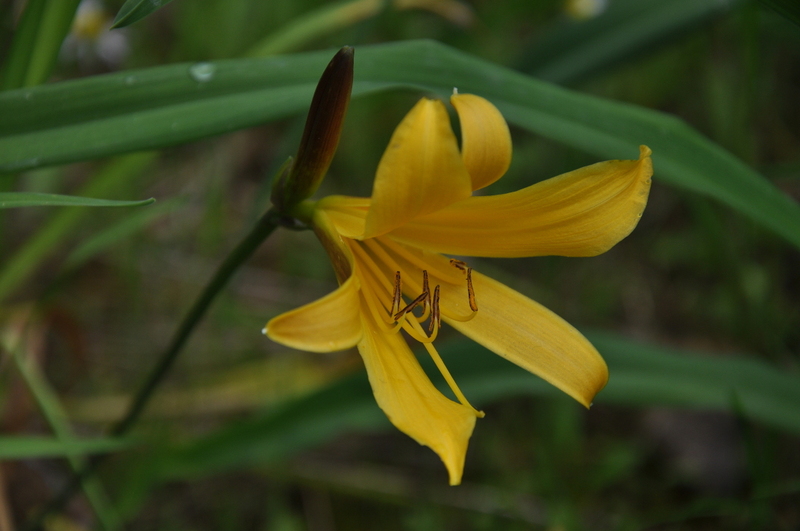 The flower is very spidery, having the longest tepals of all Hemerocallis species. The scapes are well branched and the tip of the bud is dark purple. The flowers open at sunset and on less hot summer days, especially when it is cloudy, the flowers may still be open and remain nice until noon. H. citrina var. vespertina (Hotta et Matsuoka, 1966) is like the H. citrina of Japan (also H. citrina occurs in China). But the tepals are not as long and the bud tip is not dark purple and only a bit darker than the rest of the bud. The larger buds and the sepal outside can under some conditions, have some brown purple colouring above the normal colour which is comparable with e.g. H. dumortieri (this is not seen on any other of the section Citrinae). 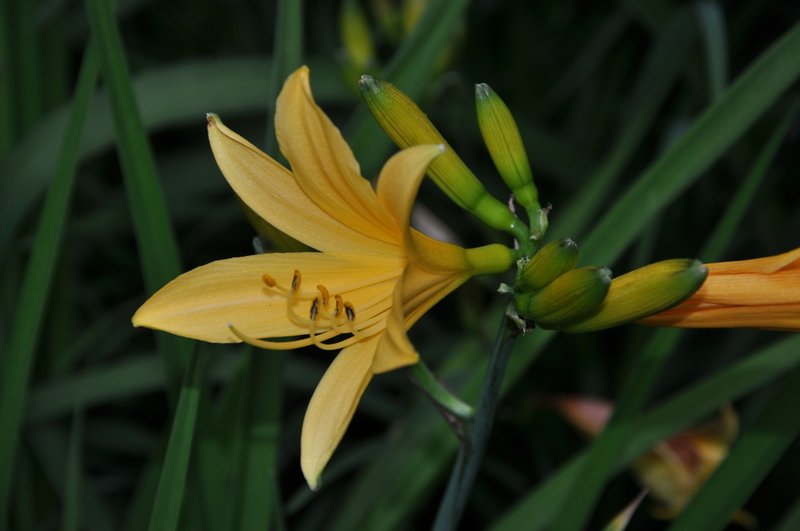 H. middendorffii (Trautvetter et Meyer, 1856) is normally the first Hemerocallis species to flower in the year. In order to protect the buds as long as possible against frost, it has broad bracts surrounding the head-like inflorescence containing the buds. The scape stays a long time in the leaves (flowering just above the leaves) which gives an additional protection against late frost for the scape and the buds. 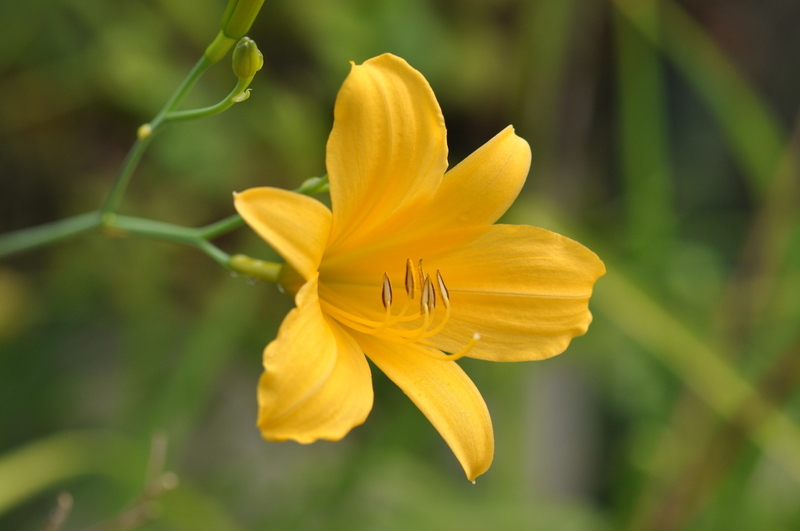 It very seldom re-blooms in autumn or late summer. H. dumortieri (Morren, 1834) has only few flowers like H. minor. Normally the flowers are in pairs, i.e. 2 or 4 flowers, but this is not the case on every scape. The plant is rather low growing and the scapes are relatively thin. The buds and the sepal outside are strongly tinged with dark brown-red colour. The flower is a bit spidery and relatively small. Probably most cultivars with dark brown-red tinged buds have H. dumortieri in its ancestry (e.g. H. 'Corky'). H. major (Baker, 1895) also known as H. aurantiaca 'Major' has wonderful orange-yellow flowers. The flowers are the largest in the section Middendorffiae. The inflorescence is not as narrow as the others in the Middendorffiae section. It is the only really evergreen species. In late summer it develops a set of new leaves when the old leaves start to die. If a plant with the name H. aurantiaca is offered or cultivated, it is most likely to be H. major, and not H. aurantiaca (i.e. natural hybrid between H. major and a H. fulva). H. exaltata (Stout, 1934) has a rather compact inflorescence but it is not as compact as H. middendorffii because there is visible branching. The flower can vary between spidery to a more round appearance as shown in the picture. It is only known from two Japanese islands, Tobishima and Sado Island. H. esculenta (Koidzumi, 1925) has a compact inflorescence with 2-3 short branches. While the tube is very short, the flower is larger than that of H. exaltata to which it is closely related. 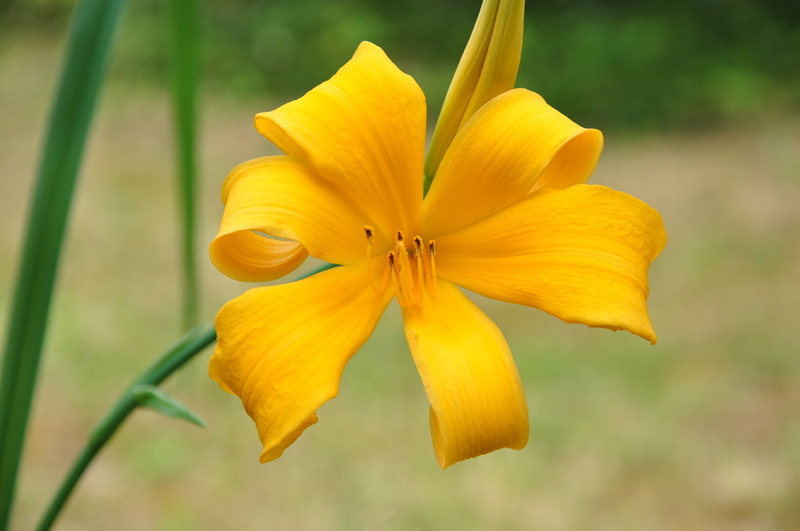 But it flowers earlier than H. exaltata (which starts to flower when the Europa daylily starts to flower). Its origin is also Japan. H. multiflora (Stout, 1929) shows nice branching and the flowers are apart from each other. The longer the scape is in flower, the more it bends towards the ground (to some degree due to the weight of the growing pods and remaining buds). Due to this habit, it is not often used for hybridization as the scapes are relatively thin. H. plicata (Stapf, 1923) is seldom found in cultivation as the species is not widely distributed and is sometimes a bit tricky to cultivate. Tomas Tamberg received a species in Germany which came from northern Sichuan (China) via Roland Willumeit. He called it "mini-sp." and used it for hybridization and produced the cultivar 'Keulenfalter' (Tamberg, 2012); a hybrid between H. altissima x H. plicata. The branching of H. plicata resembles very much that of H. multiflora, but the flowers are a bit larger, more spidery and stronger in colour. It does not like too much wet on its feet in winter. H. hakuunensis (Nakai, 1943) has its origin in Korea. It is also nicely branched like H. multiflora, but the scapes are broader and, therefore, stand stiff even when in full flower. The flowers are also a bit larger and open up a bit more than those of H. multiflora. Most plants which D. Apps and L. Batdorf brought back from Korea named H. coreana are actually different clones of H. hakuunensis. H. fulva var. rosea 'Rosalind' (Stout, 1938) is one of the three plants with rose coloured flowers which A. B. Stout received from Kuling via Dr. Steward. The variety was already described in 1930 by A. B. Stout mainly based on this clone, but only in 1938 did he give the name 'Rosalind' to this clone. It is one of the nicest H. fulva clones and its clear rosy colour, with the red eye and its spidery look, makes this clone distinctive. H. fulva 'Kwanso' (Kitamura, 1964) is one of the triploid fulvas. 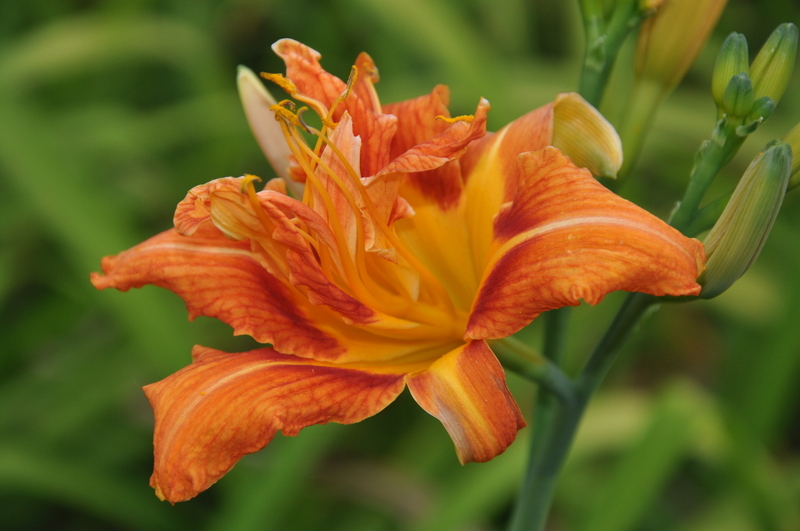 Together with H. fulva 'Flore Pleno', these are the only double flowering Hemerocallis species. Both double flowering species have some variability in the flowers depending on the conditions, which makes it sometimes difficult to distinguish them from each other. But there are always enough flowers per season that allow us to distinguish them. 'Kwanso' is normally not as double as 'Flore Pleno'. The tepals of the flowers are not so well arranged as those of 'Flore Pleno'. Most 'Kwanso' flowers still show a short style on which the additional petals are attached (under some conditions the flowers are almost single with an almost normal style with only some petal tissue, but under other conditions the flowers look almost the same as the ones of 'Flore Pleno'). H. fulva 'Flore Pleno' (Veitch, 1860) is the double flowering H. fulva with the well-arranged tepals. The colour is normally a bit more vivid than that of H. fulva ' Europa'. 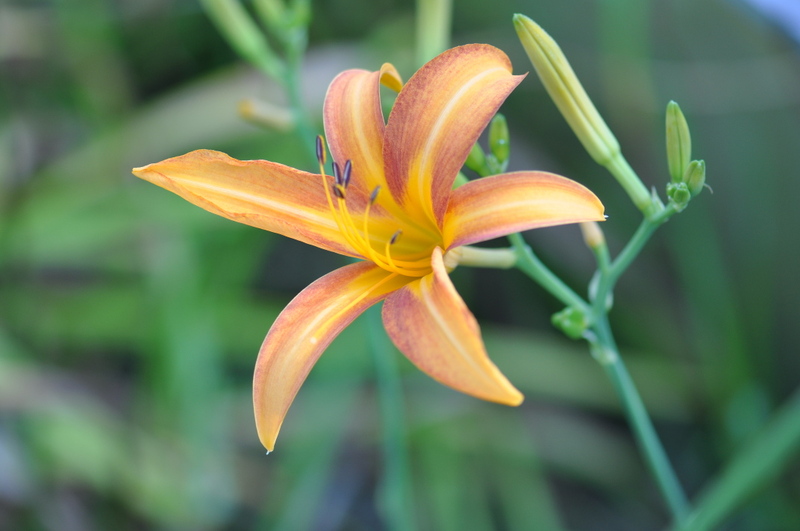 The additional petals sometimes show anthers with pollen at the near top border. Under some conditions, the flower is so double that the central petals form a cone which does not really open. There is no short style visible even if the flower is cut in half (while H. fulva 'Kwanso' normally shows a short style before the additional petals are grown from it). H. fulva var. littorea (Hotta et Matusoka, 1966) grows in Japan near the coast (i.e. 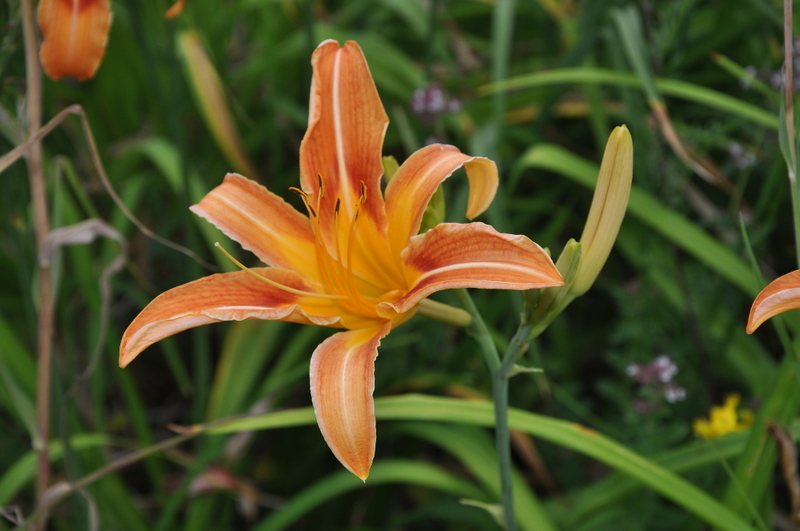 coastal daylily). Depending on the conditions, the flowers show a nice red overcast in the eye region and at the tepal margins. It flowers rather late in the year (end of August); only H. fulva var. sempervirens flowers later. H. fulva var. 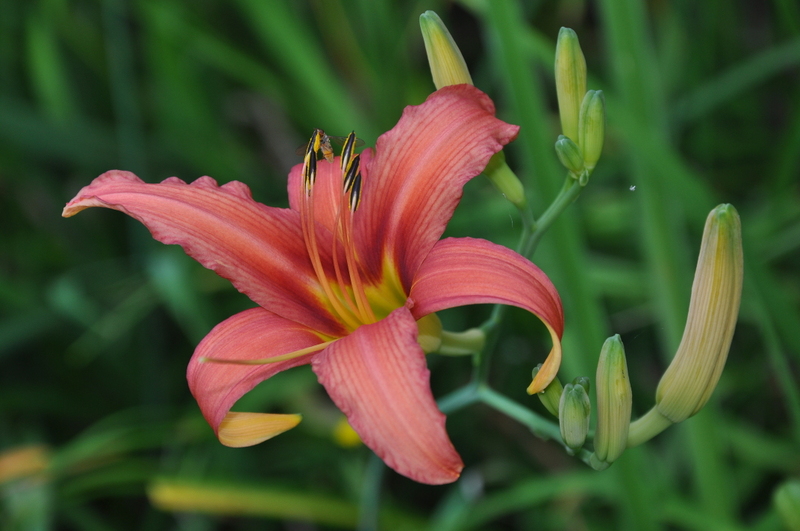 sempervirens (Hotta et Matsuoka, 1966) is the last daylily to flower in the garden. In some years it does not produce scapes, or the scapes will get caught by frost before any flower opens in areas below USDA zone 8. 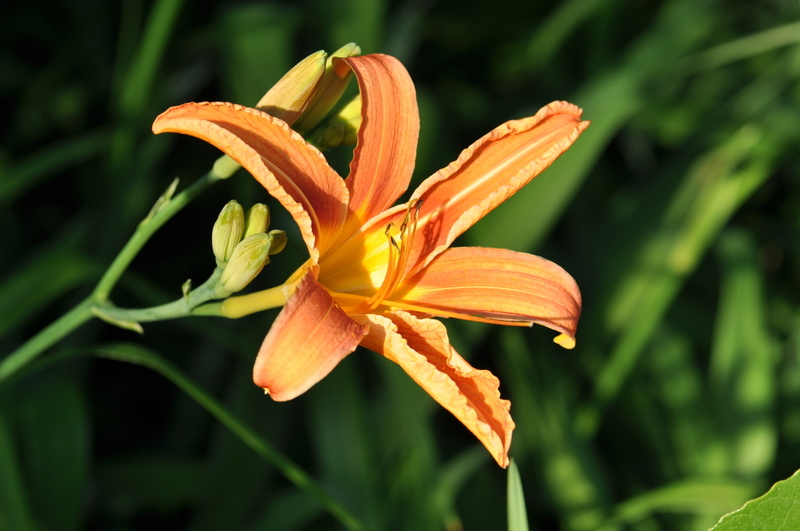 Even if the flowers open, if the temperatures are normally low, the flowers do not open nicely and the colour is not as nice as in their natural habitat, or under warmer conditions. Therefore, it is not as widely spread in gardens. In our European climate, it is also difficult to hybridize with it, as there is almost nothing in flower and the pods may not ripen until the first frost. H. fulva var. pauciflora (Hotta et Matsuoka, 1966) is a triploid species native in Japan. Besides being triploid, it is one of the smaller fulvas. It is not so well known and distributed in gardens, but the flowers with its orange base colour, the orange-red veining and its later flowering than the well known 'Europa', makes it worth growing. H. fulva var. maculata (Baroni, 1897) looks very similar to H. fulva 'Europa', but its flowers are larger. It is also a triploid species, but growing together with other H. fulva clones like 'Europa' and 'Cypriani', it is not so competitive so it will be overgrown and will disappear. It starts to flower a bit later than H. fulva 'Europa'. H. fulva 'Cypriani' (Mueller, 1906) has coppery-red flowers with a bright midrib. It flowers a bit later than H. fulva 'Europa' and looks similar to Perry's cultivar H. 'Margaret Perry'. H. fulva 'Europa' (Stout, 1929) has been long known in Europe. Together with H. lilioasphodelus, it was included in the Species Plantarum of Linne in 1753. But it was Stout who gave this name to the clone in order to distinguish it from the whole species, which not only contains other forms and varieties, but also clones which were not named (in cultivation as well as in the wild). The real origin of this clone can no longer be determined due to early cultivation not only in the Far East, but also in Europe and later, in the USA. Like most H. fulva, it is so hardy and tolerant to rather bad conditions, it can even survive outside more than one year in water (if the leaves are above water level; also winter freezes do not kill it). This plant is triploid and, therefore, almost sterile but there are a few successful hybridizations. In some cultivars there is also H. fulva 'Europa' in its ancestry like, e.g., in H. 'Theron' (Stout, 1934). H. fulva var. rosea 'Pastelrose' (Plouf, 1941) was the second of the three H. fulva var. rosea sisters which was described in the literature. The description is only minimal: "We obtained a form of H. fulva rosea which we named Fulva var. rosea 'Pastelrose'. It is much more pink than 'Rosalind' and without the deeper eye-zone." The flower itself is a bit larger than the sister 'Rosalind'. The third of the three H. fulva var. rosea was not described in literature and, therefore, does not really have a form name; commonly it is known as the 'Nesmith clone' as Mrs. Nesmith got a clone of this plant from A. B. Stout for hybridization. Instead of describing the individual species, it may be more informative to give a "Key to the Species" based on the above groupings. But before going into these details, it is better to omit the "species", which are probably hybrids or synonyms of another species. most of the plant material brought back from the Korean trip by D. Apps and L. Batdorf (1988) looked to be special clones of H. hakuunensis (but a few of them could also be H. taeanensis and H. hongdoensis). H. darrowiana --> based on only one herbarium voucher looked like a proliferation (no roots) on which Hu (1968) described as a new species, probably a proliferation from H. middendorffii which can also rebloom under certain circumstances, and it occurs also in Sakhalin Island from where this herbarium voucher came from. H. pedicellata is looked at by Hotta & Matsuoka (1966) as being a synonym for H. esculenta with longer pedicels. Based on the characters of H. forrestii, it looked like this species is an ancient natural hybrid between a species of the Middendorffii group (maybe a predecessor of H. nana) and the Multiflora group (maybe a predecessor of H. plicata), which developed several thousand years ago and evolved meanwhile into its own species. All these 3 species, i.e. H. forrestii, H. nana and H. plicata grow in the Chinese province Yunnan. Tepals normally not more than 7cm long, bud tip normally same colour or only a little bit darker than the rest of the bud; sepal outside can sometimes get brownish-red towards bud maturing; origin is Japan H. citrina var.